One may find Alliance brand Plotter Ink-Jet Paper goes through a rigorous inspection. The use of high quality paper and material produces crisp and as our papers each roll is lint free and protectively sealed for long term storage (which is important since there are some that convert paper in their garage after ordering from an Asian company and this is not PCI compliant). Here u will find vivid images that are easily readable and longer lasting. There is never any smearing or smudging of ink. 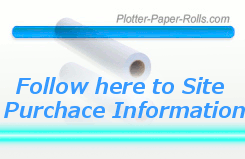 Our top quality plotter papers Ink Jet Media unrolls straight and even for a quality print the first time.